Sometimes a normal, seemingly every day encounter can teach you an important life lesson. The other day Brea (my wife) had asked me go by Taco Bell for dinner and, since she’s over six months pregnant, she gets what she wants. She couldn’t remember if she liked the Gordita or Chalupa better, so she described what it was like then I went straight to the Taco Bell Drive-Thru. As I pulled up to order, I asked the guy on the other side of the speaker if he could describe to me what a gordita is. His reply: “It’s a Gordita.” You may be shocked, but that didn’t really help me on my quest to get my preggers wife the exact item of food she desired, so I pressed further. “Ok, what kind of shell does it have?” “A gordita shell” was his response. At this point I started to wonder if I was really just dumb, since apparently everyone else in the world knows exactly what a gordita is. I attempted once more to get a little more information about this elusive delicacy by asking, “Could you describe it some for me?” His reply, “It’s a taco inside a gordita shell.” So I just said, “Ok, I’ll take one” and hoped that this would satisfy the woman carrying my second child in her womb. I worked the drive-through at Chick-Fil-A in high school and college, so I know how hard it is to communicate over the intercom, but I left there feeling like the cashier could have done a little better in his explanations of the gordita. I probably could have asked better questions, too. Thankfully, Brea was happy with the gordita, so I didn’t have to make another Run for the Border. An example they gave in the book was a test that was done where people would tap out a popular song for another person to guess what the song was. The songs were common ones like “The Star Spangled Banner” or “Twinkle Twinkle, Little Star.” It would seem like that would be really easy to guess one of those songs if you heard it being tapped out, but it’s really not. If you don’t believe me, try it out with someone. This encounter did make me wonder about how preachers and teachers in the church do the same thing. How often do we talk about things like grace, fellowship, mercy, forgiveness, and repentance assuming that everyone knows exactly what we mean by each of these terms? Once you know what these terms mean it’s really hard to refer to them as anything else, but if you don’t know what they are you’ll probably be lost. Thank you, Mr. Taco Bell Drive-Thru Dude, for an important reminder to communicate with people in a way that they will understand. Where have you seen or heard the curse of knowledge in your everyday life? Gordita image courtesy of flickr user The Canyon Guru. Good post. I've tried that "tap a song out" game and it didn't work to well. As a matter of fact, if you want to get some good pictures of people with completely confused looks on their faces, play that game and have a camera ready. I like the redesign too. Looks sharp! I haven't been to your blog lately (sorry), but I really like the look of it. And this is a very good post. Mr. Gordita Man must never have been taught that you aren't supposed define a word with the word itself. No apology needed. I hadn't been blogging for a while, so there wasn't much to see. I thought it was odd that he defined gordita with gordita, too. I can describe the Gordita pretty well….but its not pretty. Nicely done Kev…..just think…when you are pastoring that DFW megachurch someday….I can say I knew you when….God Bless! 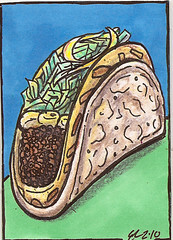 How would you describe the gordita? When I read the chapter in Made to Stick I tried it with Brea. I was really frustrating. Good idea about the pictures. Have you been somewhere when they did that?